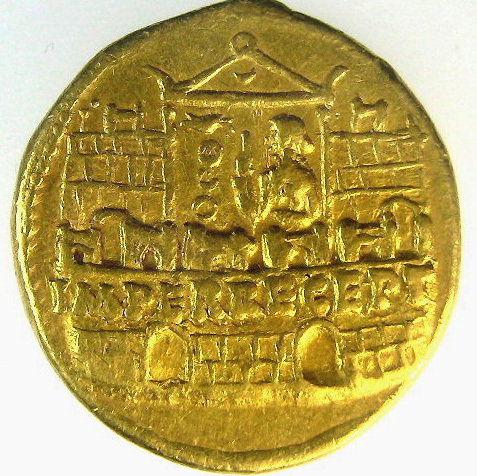 Between 211 and 202 BCE, the Romans defeated Carthage in the Second Punic War, took over the gold mining region of Spain, and minted their first gold coins. But it wasn't until Caesar returned from his victories in the Gallic wars with enough gold to issue 200 coins to each of his soldiers, and pay off the Roman Debt, that the aureus came into wide circulation. 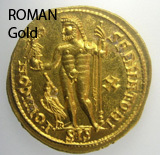 Originally, at about 8 grams, the aureus was comparable to the stater in weight; and one aureus was a month's pay for a legionaire. Coinage also served as the Empire's newspaper, as each issue served notice as to who was in charge, what they looked like, their military accomplishments, conquests, public building projects, and religious honors. As the Empire expanded, Rome was able to acquire gold from West Africa, Macedon, the Bosporus region and the Zagrean Mountains. At the same time, Rome was able to export a stable monetary system as well as a network of relatively safe highways and shipping routes that promoted an era of prosperous world trade. By the time of Constantine, after many reforms and debasments, the areus weighed slightly more than half its original weight and was replaced with the Solidus at about 4.5 grams. 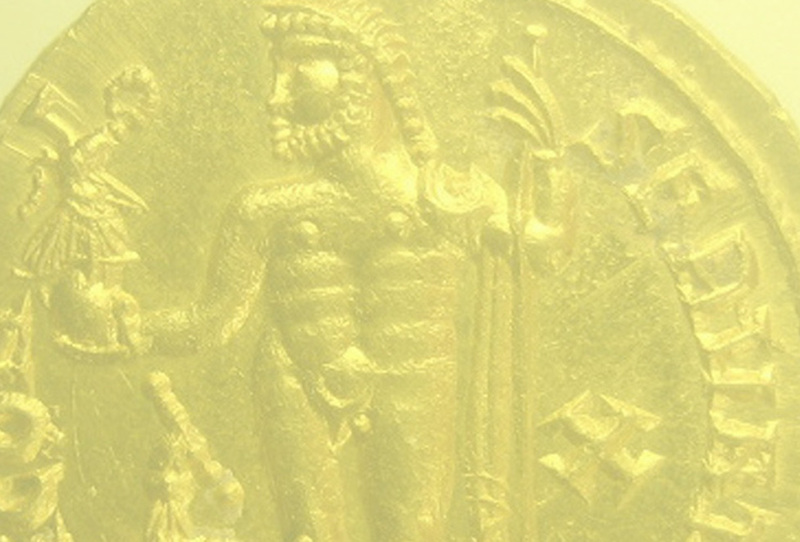 The solidus (fine gold) retained it's status as the world's trade coin for the next 500 years. ROME Anonymous. Ca. 211 BCE. AV 60 asses , (3.31 gm) Head of Mars right, bearded, wearing crested Italo-Corinthian helmet; mark of value VI (ligate) X beneath / Eagle standing right on thunderbolt, wings spread; ROMA below. Crawford 44/2. Bahrfeldt 4a. Sydenham 226. A nearly perfect specimen, with full mint luster, cleanly struck from fresh dies, and possessing considerable detail seldom encountered on this type. After 2000 years, Julius Caesar is still the most famous human ever to have lived. His very name has come to mean "king" in various languages. He hailed from a patrician family that was relatively poor and dwelled on the fringes of Roman politics. In spite of this he was able to outmaneuver opponents such as Cato and Cicero to attain his Consulship. It should be noted he went deep into debt to do so, and had he lost he would surely have been banished or killed by his enemies. After his consulship he attained a Pro-Consulship in Gaul. Once there, his military achievements are legendary - thanks in no small part to his literary acheivements. He was also the first Roman to communicate offically through the use of letters within Rome, as well as the first consul to have scribes officially record and publish every speech he gave at the senate. His written accounts of the Gallic wars rank amongst the best selling books of all time. Romans, at the time, awaited breathlessly his regular missives of triumph from Gaul - and endlessly debated his methods which were considered harsh even by Roman standards. 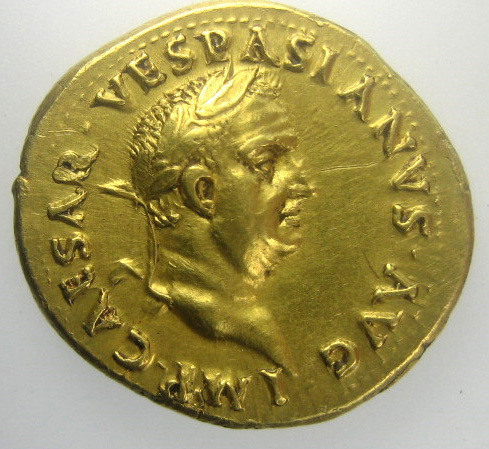 Caesar was also the first Roman to put his portrait on a coin. 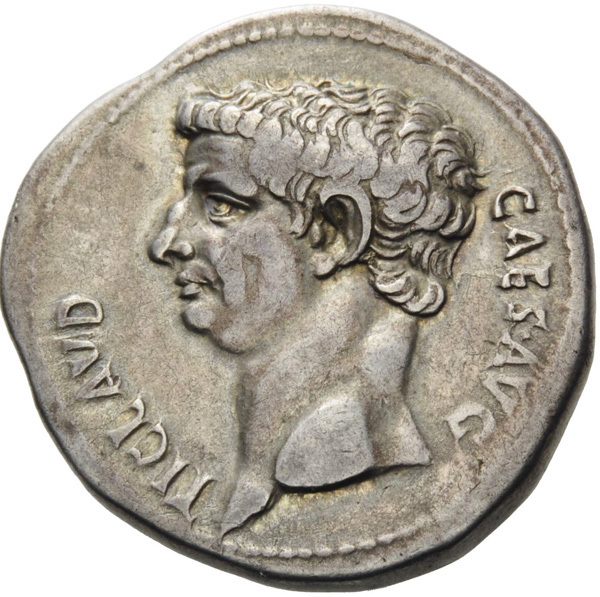 Octavian struck many Caesar portrait coins during the Roman Civil Wars emphasizing his lineage to his adoptive Father. But the vast majority of Caesar portraits portray a cartoonish stick-figure hastily engraved at military mints in the midst of war, to pay impatient battle weary troops. Fine style Caesar portraits engraved by artists of talent a rare. The Caesarians. Julius Caesar. Late 46-early 45 BC. AV Aureus (21mm, 8.02 g, 7h). Rome mint. Draped and winged bust of Victory right, hair rolled back and collected into a knot behind; C • CAES DIC • TER / Guttus (single-handled sacrificial jug); L • PLANC upward to left, PRAEF • (VR)B downward to right. Crawford 475/1a; CRI 60; Sydenham 1019a; Calicó 45a; BMCRR Rome 4119-21; Biaggi 29; Kestner 3669; RBW 1663. Plancus was a friend of Caesar and served under him in the Gallic and Civil Wars. He was consul in 42 BC according to the arrangement made by Caesar and then followed Antony to Asia, but deserted him in 32 shortly before the outbreak of civil war with Octavian. He resided at Rome for the rest of his life, and it was on his proposal that Octavian received the title Augustus in 27 BC. The Caesarians. Julius Caesar. 44 BCE. A regal portrait of excellent style, beautifully centered on a full flan with a striking old cabinet tone. The Caesarians. Julius Caesar. 43 BCE. AR Denarius L. Flaminius Chilo and Julius Caesar, 43 BC. Denarius Silver, 19mm, (3.60 g ), Rome. Laureate head of Julius Caesar to right. Rev. L.FLAMINIVS IIII.VIR Goddess, Venus or Pax, standing to left, holding caduceus in her right hand and long scepter in her left. Babelon (Flaminia) 2, (Julia) 44. Crawford 485/1. CRI 113. Sydenham 1089. Dramatic Pedigreed Masterpiece of Roman portraiture in high relief. Beautifully toned with sound metal on a very broad flan. Some very minor striking flatness on the wreath. Struck in Rome probably in August 43 after Octavian had regained the city. The very prominent and detailed laurel wreath he wears (mixed with leaves and laurel berries) hints at the Senate’s forthcoming proclamation of Caesar as a god, which took place on 1 January 42. This enabled Octavian to call himself "Divi Filius:" Son of God. From the Stoecklin Collection, (noted on the holder) bought from Hess AG in Luzern. AR Denarius (3.76g), Struck at Rome, 40 BC by the moneyer Ti. Sempronius Gracchus (not otherwise known). No legend with wreathed head of Julius Caesar facing right, S C either side of neck. Reverse: TI SEMPTONIVS GRACCVS Q DESIG, legionary eagle between standard, on left and plough and measuring rod (decempeda) on right. Craw. 525/4a; CVRI 327a; RSC 47; Sear 1427. Wonderful realistic fine style portrait, remeniscent of contemporary busts such as the one in the museo dell opera del duomo. Underlying luster and lightly toned on a broad flan.. Extraordinary condition for this very rare type. The reverse probably alludes to Octavian's victories over Lucius Antony and the subsequent forming of the second triumvirate which left him in firm control of Rome and the westen provinces. Divus Julius Caesar (died 44 BC). AR denarius (18mm, 3.55 gm,) Rome, posthumous issue struck by L. Mussidius Longus, moneyer, 42 BC. Laureate head of Julius Caesar right / L • MVSSIDIVS • LONGVS, rudder, cornucopia on globe, winged caduceus, and flamen's cap. Crawford 494/39a. Sydenham 1096a. Babelon Julia 58 and Mussidia 8. RSC 29. The finest portrait available for this issue, with an atractive old cabinet tone. The Caesarians. Divus Julius Caesar. 40 BCE. AR Denarius (19mm, 3.58 g, 12h). Rome mint; Q. Voconius Vitulus, moneyer. Wreathed head of Caesar right / Bull-calf walking left. Crawford 526/4; CRI 331; Sydenham 1133; RSC 45. A very rare portrait of wonderful style of a youthful vigorous Caesar by an artist of great talent. Amongst the finest style Caesar portraits, perfectly centered on a broad flan and with a beautiful old cabinet tone. The moneyer Vitulus was an ally of Octavian, and this coin was struck just after the youthful vigorous Octavian had taken control of Rome and the Western provinces. The youthful Caesar portrait was certainly meant to justify the great power Octavian had achieved at the tender age of 23. Virtually perfect example of this popular issue. FINE STYLE: The Twelver Caesars. After Julius, Caesar became a title. The lives of the next eleven Emperors along with Julius, were chronicled by the Roman historian Seutonius. Thereafter these became know as the Twelve Caesars. There were six from the Julian Clan: Caesar, Augusts, Tiberius, Caligula (Gaius), Claudius and Nero. After Nero was murdered there was 'the year of the four Caesars:' Galba, Otho, Vitellius, and finally Vespasian who founded the Flavian dynasty and was succeded by his two sons: Titus and Domitian. The coins of the Twelve Caesars are relatively common by ancient standards. The monetary requirements of the Empire were as vast as its ever expanding territory and citizenry. Nevertheless, coins engraved in true fine style by artists of merit are rare. NGC, on the whole, does a good job of identifying these coins, but inevitably a few coins will slip through the cracks; and even within the "fine style" designation there can be coins of vastly differing artistic quality. Coins that capture and convey the personalities of the Twelve Caesars, and other charismatic Emperors will, over time, certainly provide collectors with far more satisfaction than those that are merely well preserved. AR Denarius (17.5mm, 3.62 g). Pergamum mint. Struck 27 BC. Bare head right / Bull standing right. RIC I 475; RSC 28. 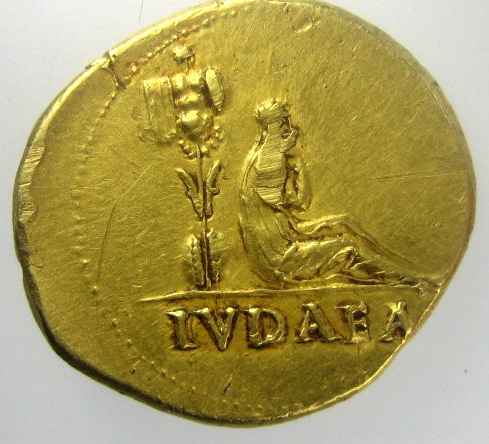 This coin was struck in the first year of Augustus' reign by an artist of great talent.. The issue is scarce, but very few of the examples are represented by this engrossing realistic portrait. Here we see Augustus as a handsome, noble and victorious young man. He has just defeated Marc Antony and married the young, beautiful Livia. At this moment, Augustus and Livia were the most powerful and glamorous couple of the ancient world. IONIA, Ephesus. Cistophoric tetradrachm (Silver, 27mm, 11.03 g ), 41-42. TI CLAVD CAES AVG Bare head of Claudius to left. Rev. 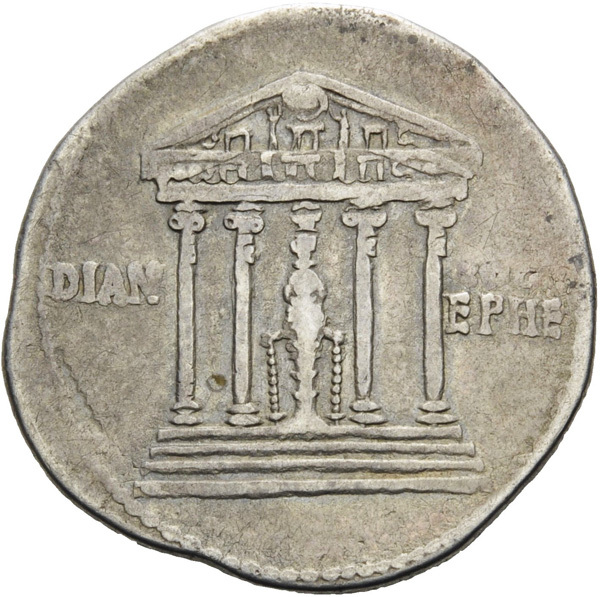 DIAN - EPHE Frontal view of tetrastyle temple of Diana at Ephesus, her cult statue within with fillets hanging from her wrists, polos on her head; the temple stands on a podium of four steps and has a pediment decorated with figures. BMC 229. BN 229. Cohen 30. RIC 119. RPC 2222. Claudius ws not an attractive man. His physical infirmaties caused Romans to consider him mentally infirm. Once emperor he turned out to be quite brilliant. But his unrequited fascination with beautiful young women proved his undoing. 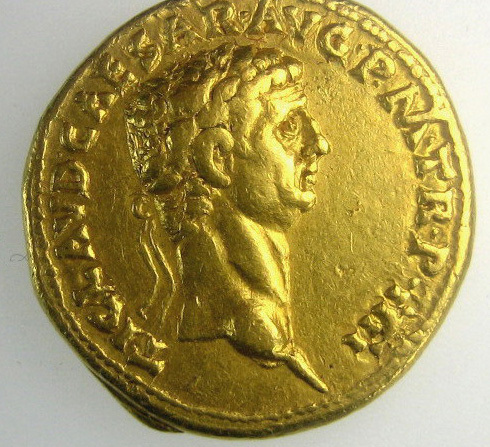 The most accomplished Claudius portrait on coinage. A nicely toned and well-centered example of this large silver coin. The portrait obverse is in far better state of preservation than the reverse. Here we have a very rare and wonderfully realistic portrait of Galba as the 72 year old General that he was when he assumed the throne for seven months in 68 AD. The line of the Julio-Claudian emperors had died out with Nero, but the new emperor Galba still wished to demonstrate continuity with the dynasty that had ruled for the last century, via his close friendship with Livia. A Fine Style contemporary forgery of a Domitian denarius. These contemporary forgeries are quite rare as the penalty for forgery was death, and any forgeries discovered would have been destroyed. This coin, by virtue of extremely fine craftsmanship ws able to survive detection. VESPASIAN (AD 69-79) Av Aureus (7.39g) Rome 69-70 Laureate Head of Vespasian right, IUDEA mourning jewess seared right beneath trophy. Mazzini I pl lxii (this coin) RIC 15. Provenance: Ex Kollack collection. Ex Mazzini collection, Ex Burrage collection. Antiqua.